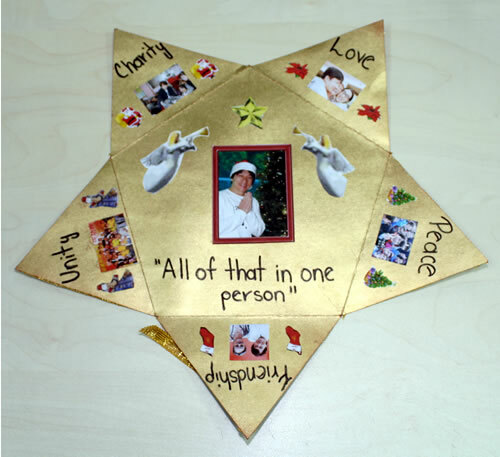 Thanks to Petra for sending in another very creative and beautiful Buddy Bear. 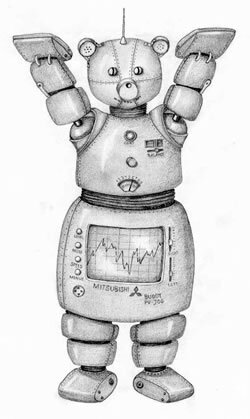 This one is called Robo-Buddy. Click here to see all the Buddy Bears. Not a drawing this time, but an amazing needlepoint. Click here to visit the Art Gallery. Have a look at the unique drawing that Simon from Poland sent in. 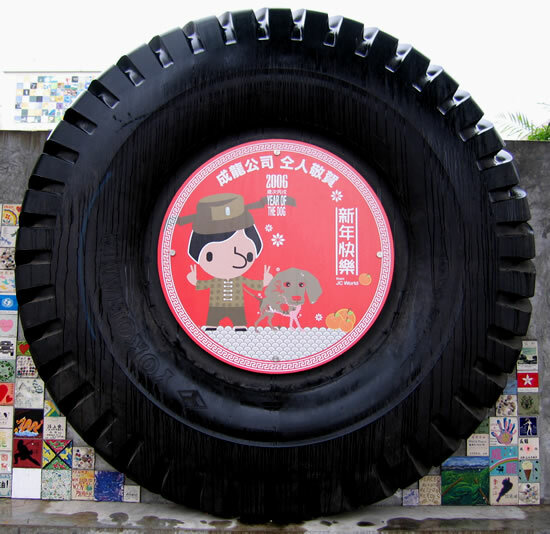 It's in our Jackie Chan Art Gallery! 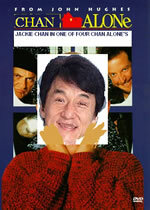 And Ken has sent in a Jackie Chan Movie That Wasn't! 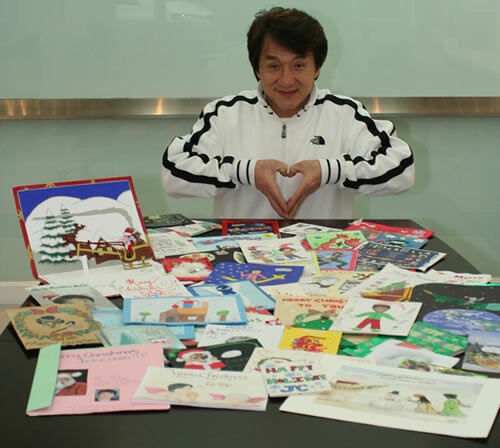 ...here is Jackie with all the beautiful cards that everyone sent in this Christmas. You made him very happy! Jackie gives the designs a "thumbs up." 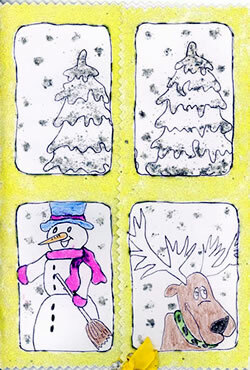 We decided that one card deserved a special mention. 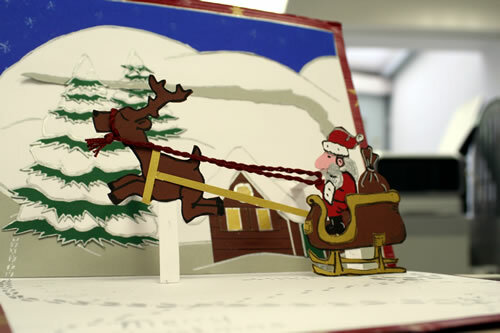 It was created by a family in Hamburg, Germany and it was not only clever and well-made, it really demonstrated the spirit of the season. Congratulations to Sophia, age 10 ("Cut"), Constantin, age 13 ("Production Designer"), Alexander, age 16 ("Logistic Director"), and Iris, Mom and "Executive Producer." Thank you to everyone who sent in a design. 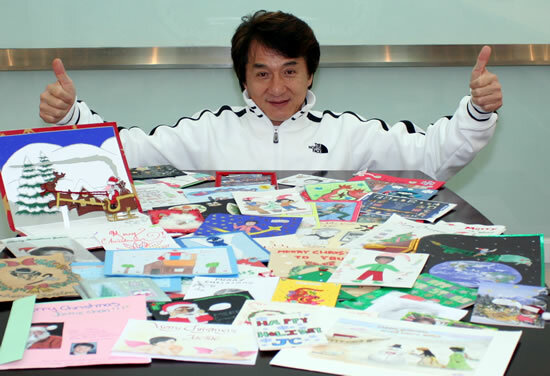 They were really special and Jackie loved them all! The three winners MUST send an email with their mailing address in order to claim the prize. Click here to see what the prizes are. If you look up into the night sky and find Polaris, the North Star, you will see a constellation nearby called Dragon (Draco). And if you look very carefully you will see one star shining quite brightly in the Dragon constellation. 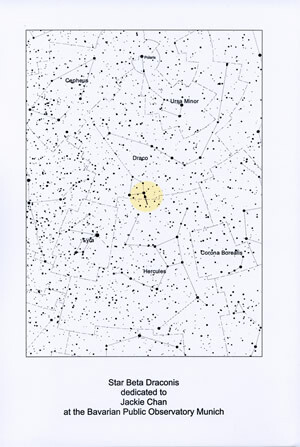 That star is called Beta Draconis. 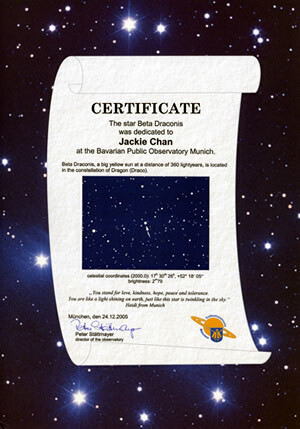 It is 360 light years away and what makes it special is that it is dedicated to Jackie Chan. "You stand for love, kindness, hope, peace, and tolerance. 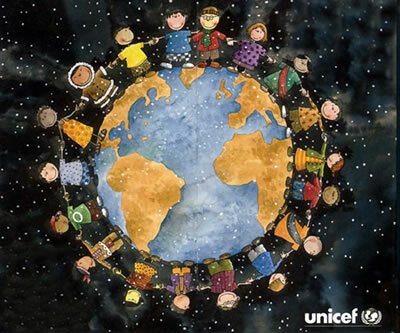 You are like a light shining on Earth, just like this star is twinkling in the sky." 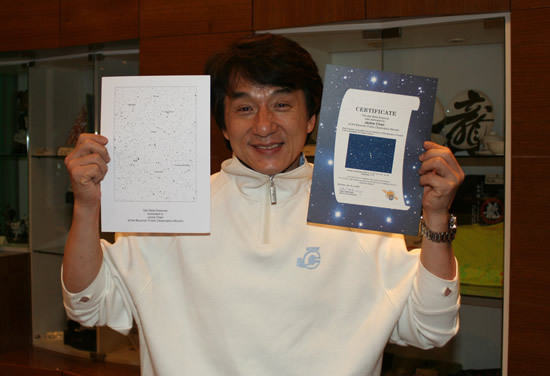 Jackie wanted to share it with all of you who visit the website, so here he is with his star map and star certificate! Some fans have been very busy making new Jackie Chan "Movies That Weren't." Click below to see all the new ones (and a lot of older ones too). 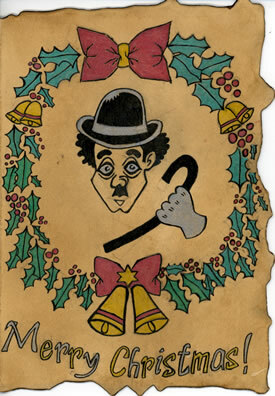 If you would like to add to the collection of funny Movies That Weren't, just send your project to the webmaster. If you have sent a project in but don't see it posted, please send a reminder.